The plastic piping bag offers specific advantages for various fields of application, and is demonstrably more eco-friendly. One Way is aware of how important this is for sound operations. In order to save time without loss of quality, and still achieve huge cost savings in terms of cleaning and sterilisation. One Way piping bags are preferred by end-users who choose perfect quality, food safety and optimum ease of use. With its special ‘soft touch’ grip, Comfort Green represents the top-of-the-line segment in piping bags. Comfort Green uses a unique, patented production process. The unique characteristics of the extremely flexible yet firm-grip multi-layer foil ensure that the professional can continue to achieve clean, precise results even after hours of repetitive actions. The Comfort Green works just as well as the cotton piping bag and can also be easily changed over and filled up. The master knows that the smallest mistake can cause irreparable damage. That is why we offer Comfort Green - efficient and effective for every professional. The undisputed Number One in piping bags. The Comfort Green piping bag guarantees efficiency in the kitchen and optimum food safety. Disposable piping bags always come straight off the roller, or rigid and clean from the box, fit snugly in the hand, and are also very easy to use. Safety is extremely precious in all professional (large) kitchens or bakeries. Cold and light fillings are processed better with One Way’s Cool Blue. The ingredient can be precisely applied to obtain a beautiful, aesthetically pleasing end-result, down to the finest detail. For example, whipped cream or mousse. Tarts or desserts will earn a star within seconds! The Cool Blue piping bag guarantees efficiency in the kitchen and optimum food safety. 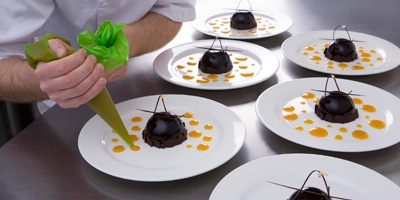 Disposable piping bags always come straight off the roller, or rigid and sterile from the box, fit snugly in the hand, and are also very easy to use. Safety is extremely precious in all professional (large) kitchens or bakeries.